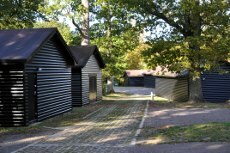 During World War Two, a group of wooden huts was built in a clearing on the edge of Tilgate Forest for use as a dormitory by the Canadian Air Force. After the war, the huts were used as a community centre. The great storm of 1987 damaged many of the huts, and all of the huts on the site were rebuilt. They are now owned and managed by Crawley Borough Council and used by clubs and societies in Crawley. Tilgate Forest Recreation Centre is next to the K2 Leisure Centre. Follow the directions to the K2 Leisure Centre. After leaving the A23, go straight on past the leisure centre down a narrow lane to the right. Watch out for the speed bumps and chicanes!